HE TRADITIONAL APPROACH to getting Playing Cards produced has to be by Printing them. But anyone who has had experience of this knows it can be very expensive, and therefore - restrictive. You could use any of several printing techniques, but experience has shown that unless you have the power of a major publisher with distribution channels, you may only sell a few hundred copies. There are playing card manufacturers all over the world - almost all of them will print your cards for you - at a cost! Some also have retail sections and produce cards to sell into retail, you could see if they like your designs. It is also possible to use a local jobbing printer. Printing can be in Black & White, block colour or full colour; the latter has a number of options depending on the quality required. Unless you're being 'published' by someone else who will foot the bill, even a small edition can be VERY expensive. Below is described how it has been possible to get small editions of cards into print - you might like to try a similar approach. Please tell us about your own experiences so that we can share these with everyone. "I approached a printer that I knew and had 'worked' with before. I asked how much it would cost to print, cut and box my cards. I then offered them about 40% more than their quoted price!" "No, I'm not completely mad (although my wife may have other views!) I offered this payment AFTER I had sold the relevant number of packs. This is not as bad as it seems as the hand-coloured decks take quite a time to complete but sell quite quickly to collectors." This relationship worked well for the two decks mentioned - enough to encourage the artist to go one step further! "2000PIPS was a full (6) colour process, each 'card' illustration was individually scanned to get the best colour balance. This was not cheap but the printers paid for this and became my co-publishers. In exchange I handle all publicity & sales and split all monies (after postage) 50/50." This sounds great, but be warned - selling large numbers of cards can be very difficult. Elsewhere on this site, we have provided a list of possible outlets for your work, but even these may not be enough. If you can, build into your plan to sell cards at trade prices too, this can be as low as 50% of the retail selling price but it may open up more sales possibilities. Elaine Lewis adopts a similar approach. After drawing the cards in outline at larger-than-life size in designer's pen and black ink, she has the complete set printed onto sheets of white card in small editions of around 50-100 by a local printer. This is the largest expense, followed by artist's materials, paints, and so on. Elaine then hand colours, cuts out and boxes the packs as required. She also applies her designs onto other surfaces, such as cushions, pottery or fabrics. The possibilities for producing playing cards on the desk top computer system are becoming extensive. The quality of the final product will depend on your printer, which might be a laser printer or a high resolution ink jet printer, and also on the type of paper used. The cards can feel so smooth in your hand that you may wish you could play blackjack with them! I have produced several home-made packs by these means. Whilst the artwork for each card can be prepared in, say, Photoshop, this can then be imported, or 'impositioned' into Illustrator, ready to print off. Another software package which is suitable is CorelDraw, but playing card manufacturers seem to use Illustrator or QuarkXpress. If you would like to produce a home-made deck of Fortune-telling cards, download: Livre du Destin or Book of Fate a nineteenth century French Cartomancy deck, with titles in French and English, published in Paris, c.1890. 32 cards. Download the entire deck (21 MB) as large size images, suitable for desk-top publishing into hand-made pack. Images courtesy Gilles Daigle. By adding a scanner or a digital camera into the system, hand drawn artwork, lettering, photographs and textures can be added into the card designs. Using the tools available in your software, a variety of special effects and shadings can be applied, as well as cleaning up the images and balancing the colours. A word of caution: with so many tools at your fingertips, not to mention the vast number of typefaces available at the touch of a few keys, it still takes a lot of care to produce a reasonable result! The use of typography for the indices and captions on the cards requires some knowledge of typeface styles and the functional requirements of a playing card. Suppose you want to design some playing cards using Adobe Illustrator. A lot of the features in playing card designs are repeating patterns, which are easy to create using copy and paste. This is particularly the case with double-ended cards. Once an outline for a feature has been made, this can be mirrored, replicated, stretched, inverted, filled with colour, etc. all around the design creating patterns. Textured and patterned fills can be very effective. Gradient fill colours must be used very discreetly and subtly. The success of playing card courts depends upon the faces, so try to draw good ones! For example, Dianne Longley's "Cats, Cakes, Clothes and Cups" playing cards were created as follows: "The images for Cats, Cakes, Clothes and Cups were brought together from a variety of sources. The Cats suit was made from photographs of mine and others generously loaned by friends. Many of the cake images in the Cakes suit came from recipe books. Who has time to photograph cakes before eating them? I spent a fun evening dressing up in a range of outfits and Patricia clicked away with a digital camera to create the Clothes images. I photographed my tea cups for the Cups suit on my kitchen table, again with the digital camera. I created the court cards by initially drawing the King, Queen and Jack with a technical pen. I scanned the drawings and then added colour and collaged faces using Adobe Photoshop. The individual card images were then placed into suits using Adobe PageMaker. Each suit comprised of the usual court cards: King, Queen and Jack, ten number cards and a Joker. The images were then printed through an inkjet printer." The following account comes from Robert Strawn in Texas (USA): "I have been for some time producing a few decks by hand. I currently am printing the decks in color using an HP 2500. When it wears out, I will either switch back to a Lexmark, or try to find a printer that will use pigmented color ink. I am currently printing on WAUSAU Exact Index Heavy Card Stock. It is 110lb weight or 200g/m^2. While I can somewhat see the other side if I hold it up to bright light, I have never been able to cheat by seeing through a card in actual play. I print the cards 3.5" x 2" the same size as a standard business card. The corners are rounded at a 1/4" radius. I used to line them up and use a Martin Yale Paper cutter, and a Lassco corner rounder, but now I use an Ellison die and die cutter. The advantage to the size I use is that they still play well, children fan them more easily, and a deck can fit into an Altoids tin. Before cutting the cards, I pin them up on a clothesline and spray paint them with Deft Gloss Clear Wood Finish. In our Texas heat, they dry at one end of the line before I reach the next. This finish also has what I think is a good feel and the lowest residual odour that I have found. I put them in gold colored metal tins. The advantage to hand production is that I can continue evolving the cards. My intention is to make a deck with the maximum value added appeal and one day to have it printed en mass. Until that time as I tinker, about once a year I produce another limited edition. My main deck is of 60 cards, with the suits of clubs, diamonds, hearts and spades. There are 16 cards per suit, with A,2-10, Page, Jack, Lady, Knight, Queen and King. Each of these cards also has text on it that allows another game, BattleRing, to be played with the deck. This is a game that simulates karate movie style combat. Quite fun actually. I have three other decks that expand the first and allow it to be used as an enormous 18 suit deck, or as a tarot deck. The extra decks also expand BattleRing, so by carrying about four tins, I have a wide range of game playing possible. While this mad project is far from financially rewarding, I'm having fun with it so far." Bob continues: "I have tried in the past, rubber (rubs off in spots) and it sticks to other cards unless you powder them regularly. Most actual varnishes become tacky when hot. Urethane, polyurethane and SPAR urethane are all good but stink for a long time. Most of the low odour clear protective coatings are the worst smelling. Oils, even silicon, often allow inkjet color dies to pass onto surfaces the card is left on. Krylon and Minwax are my second two favorites. I usually buy a spray can of a coating to try it out first. After it dries I spit on a card and rub it, run a card under the sink, and spill coke on it to test it. I use a paper towel to dry them after about five seconds. If they show no bleed of ink, change in surface gloss, texture, color or feel, I consider the lacquer to be acceptable. I also leave a few cards treated and untreated on the dashboard of my truck for a few months. A good plastic will survive the UV and protect the color from fading at least in the short term. I try to use coatings that are rated for indoor and outdoor use. Most outdoor coatings preserve and hold up longer. Most indoor coatings are low toxicity once dry. The one I use now recommends it for toys, so probably dries very safe." "The Die cutter makes a very consistent edge, but has the flaw of somewhat crimping in the edge of the card on the face side. 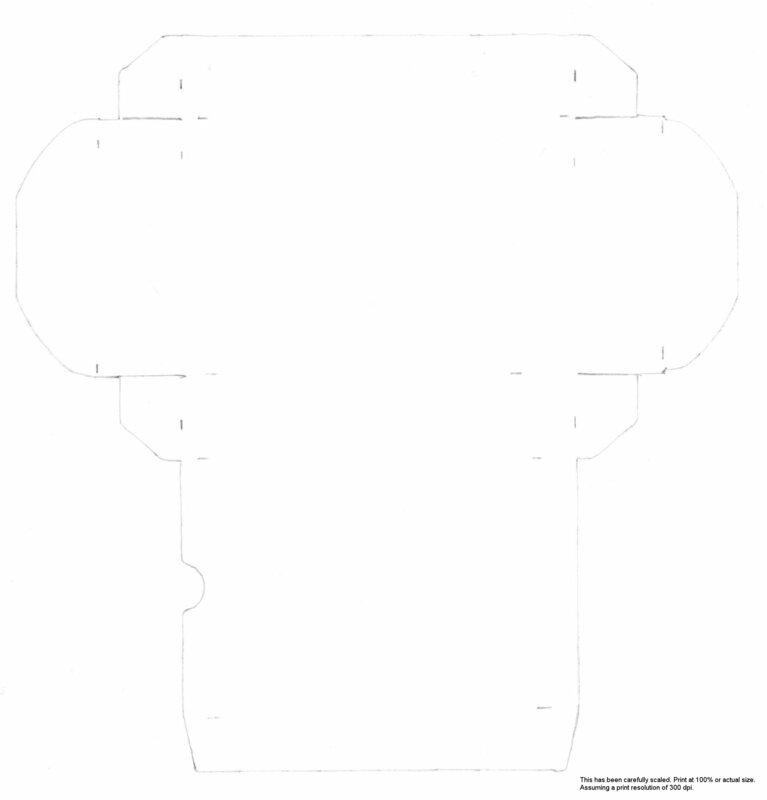 (I cut with the backside to the die to make sure the backs are unmarked.) The cards still look good and shuffle well, so I'm just commenting and not complaining." "My ultimate goal is to make a card that appeals on many levels. Years ago I saw a deck made for magicians that was for fanning. It had several solid bands of color on the backs, so that you could with a bit of practice fan out the cards and make it look like at least four different decks with just a small bit of misdirection. You could also make very attractive fans. Soon I think I will try a few bold back patterns, I don't know if I will like and keep the outcome, but a deck that could make a rainbow would be nice I think. I also want to try putting a small graphic in a small window in the top right corner of the card face. This would vary from card to card and the cards could then be riffled to animate the scene. I had a deck when I was a child that had a bumblebee that flew around like this and it was quite appealing to me. I also plan at some point to do a set of tarot graphics that will show well in the background of a card's face." As another example, the image right shows how traditional stencil colouring can be simulated using Photoshop filters such as splatter and wind, along with varying degrees of transparency and slightly offsetting the coloured areas. The palette was selected by studying genuine old cards, and then the colours were applied in layers and treated digitally, before being flattened down into the final product. It is best to build Photoshop images in layered files so they remain editable throughout the production cycle. Although this technique depends on having the memory, disk space and processing power to handle large layered files, it also allows for easier revision or reverting to an earlier version. Chris Wasshuber has researched How To Make Your Own Playing Cards and is able to supply blank sheets of playing card cardboard in small batches, corner rounders and card cutters at affordable prices. His site is full of useful advice and ideas for making your own playing cards. Beware, however, this method is extraordinarily time consuming! The following technique has been described by Ian Jackson: "The basis was a deck of blank cards. Having created artwork on a computer, I printed it onto ordinary 80g/m^2 paper using an inkjet printer (without reversal). The artwork had registration marks surrounding each card at the corners. I cut out the individual cards images from the printout sheets." "Then, for each card, I sparingly applied ordinary P.V.A. glue to the back of the printout, and placed the card carefully blank side down (i.e., patterned back up) onto the printout. At this stage there is a chance to smooth out any unevenness in the paper (which is important). Also, it is important to ensure that there is some glue all the way around the edges, and that the card is pressed down on all the way around the edge. Too much glue is bad too. I set each card-pasted-onto-paper aside to dry." "When fully dry, I used a scalpel to trim the excess paper by cutting around the edges of the card, using the card itself as a guide. This is tricky and requires a steady hand." "This process was the culmination of much experimenting, and the results were reasonably good. After a little use they shuffle and play very well (and for the game in question, which needs a small deck, the additional thickness is a help here). They are also very durable, having lasted through occasional use for some years now." "The un-laminated faces do unfortunately attract stains, and the resulting cards are quite thick and initially start out bent (due to the glue drying). However, the worst disadvantage of this technique is that it is very time-consuming. Not counting artwork production or printing, and initial experimentation, the actual cutting, pasting and trimming down to an average of approximately 5 minutes total elapsed time per card (that number is calculated by dividing the total time required to make 26 cards - just over 2 hours - by the number of cards)." Above: glue being made on an industrial scale in the 18th century. Flour and starch were dissolved in warm water and stirred by hand. The solution was then boiled in a copper vessel for 5 or six hours. After being left to cool overnight the paste was sieved to remove any lumps. The resultant paste had sufficient adhesive strength to join the sheets of paper. These operations were usually carried out in the workshop basement area. The following method has been submitted by Ian Roth (whose 'Unique' deck of playing cards is reviewed elsewhere on this site): I saw that you had some tips on hand making cards on your page and thought I would share a technique that took a while to develop, but ended up giving me great results (unfortunately I did not have 50,000 hours free to make the number of decks that I would have liked to) - but this technique gives good slippage and colours, as well as a consistent card that shows less wear than even the plastic Kem cards. There is always going to be a difference between things that are made industrially and things that are hand-made. It all comes down to your personal preferences. First the 54 images were created and made into TIF files. Then, a template was created in Quark for eight cards a page (Quark is a great tool, because you can also make one perfect card, with rounded edges and all, and then duplicate it 53 times). The front of the cards were laid out this way and printed on an EPSON photo printer (they are quite cheap). The cards were printed on thick EPSON matte paper (you can also print on double sided matte paper). A similar template was created for the back of the cards, with the eight squares being larger than necessary to make sure there was adequate bleed. The backs were printed on one blank page and then laser copied onto the back of the seven sheets with the fronts (saving time and precious ink, and preventing over-saturation of the ink on the page). I then applied Avery self-laminating sheets on both sides of the seven pages. The laminate is letter size and a clear plastic "sticker" that seals the paper. This ends up creating a "card-like feel" and a waterproof and protective gloss coating to the cards. I used a bone folder to smooth out any bubbles (there were only two or three for the entire batch). 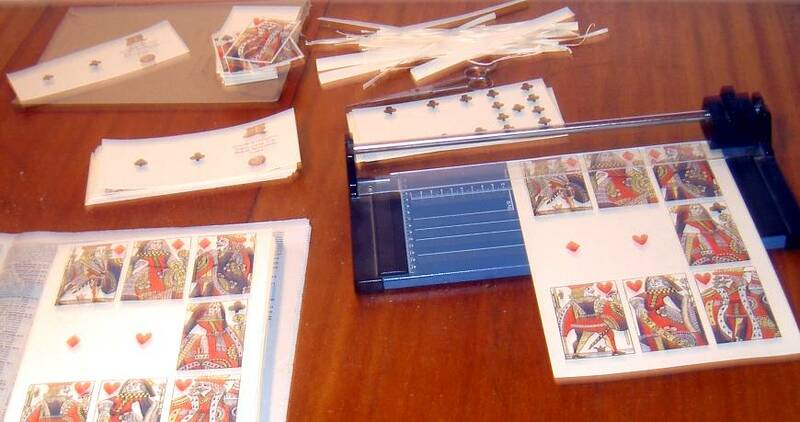 The seven sheets were then cut down in an ordinary paper cutter to make 54 rectangular cards. I then bought a Marvey corner punch (US $8) and punched perfect round corners on the all of the cards (This is a little painful, as the punch is only meant to handle paper, but if you get a hammer and use the hammer to activate the punch on a hard floor, the effect is less painful, and a lot faster, even if you live in a flat and your downstairs neighbours are wondering what you're up to). The card "sandwich" of the laminate and the board is completely undetectable to the point where people have no idea how the cards were made in plastic. One thing to watch, however, is to make sure the initial paper is opaque enough so that one cannot see through the cards. If anything, this technique is great for sample decks, and perfect for one-of-a-kind decks that actually might get some use. The overall cost is quite low, except for the number of hours spent punching the corners. See the list of equipment used in an 18th Century Playing Card Manufacturing Workshop, including blocks, stencils, brushes, etc.. There are two distinct methods to prepare copper plates for printing: engraving and etching. Karl Gerich's work is a fine example of the second approach. With etching, a copper plate is polished, heated and then given a thin coating of darkened beeswax. When this cools and sets, it is then possible to draw the designs into the wax with a needle-point, thereby exposing the copper surface beneath. The touch can be very fine so that delicate lines, dots and stipples may be achieved. When the plate is subsequently washed over with acid, the exposed copper surfaces are etched out, leaving the remainder of the surface intact where it was protected by wax. The plate is now ready for printing. The resulting printed lines have a tendency to stand out slightly in relief on the paper, and also the areas of 'white' may contain traces of ink pigment where this was not completely wiped off the plate between each impression. This can be observed in the images of Karl Gerich's work. Click here to see some early examples of engraved cards. Acid etching can also be combined with engraving, where the lines are manually engraved into the copper surface with a burin, or a very hard, sharp-pointed tool. This requires considerable physical mastery of the technique so as to avoid 'slips' or other mistakes which of course are difficult to remedy. Wood engraving and traditional woodcuts, despite the modern developments of chemical, mechanical or electronic processes, still remain the most expressive form of illustration, adding a sense of old world chivalry and romance. Copper plate engraving and etching probably come a close second. Two essential elements that make a playing card a playing card are the paper and varnish. B. The "playing card varnish" is a custom formula; most major card makers have their own. The varnish helps determine the "slip" and feel of the cards, how they slide against each other, and protects the cards from grease and dirt. If you are making hand-made cards, you should give some consideration to finishing the cards and making them easy to handle. Card magician Kevin Gallagher says "To me, the design is secondary to how well they handle since they are going to get written on, torn up and generally abused anyway". With hand-made cards, one can experiment finishing the cards by lightly polishing with wax, soap or fixative spray to make them slippery. See also: Amos Whitney's Factory Inventory Rotxotxo Workshop Inventories, Barcelona Chromolithography Design of Playing Cards Letterpress Printing Manufacture of Cardboard Manufacture of Playing Cards, 1825 The Art of Stencilling.